Hi, I`m Amity. 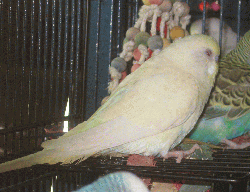 I`m a sweet little white budgie dipped in pale yellow. I`m a little bit of an older girl. I was originally a stray, but a lucky stray -- found and taken to a shelter. Then I got adopted but sometimes families change and so I`m back. I`m not tame but I am happy to enjoy life in a cage with other budgies. I have a growth on my abdomen that is being monitored by the vet, and I`m getting injections for it every couple of weeks. Despite my current illness, I`d love to join your forever home!